Virgin Trains has launched a new app which will allow passengers on its east coast services to bid for first class upgrades. Virgin believes the app, which will allow the operator to fill first-class seats that would otherwise be left empty, is a world first. Passengers will be able to bid up to half an hour before departure through the new iOS and Android app: Seatfrog. A First Class ticket entitles passengers to free food and drink, reclining leather seats, more leg room, free Wi-Fi and access to first-class lounges at certain stations. Passengers will be able to pick up an upgrade for as little as £5 through the auction and have their new ticket sent directly to their phone. The app has been designed to prevent customers from bidding more than the cost of the first class ticket they are looking to upgrade to. If they do, they’ll be asked if they want to ‘Upgrade Now’, the cost of which will still be lower than the original ticket price. As part of its franchise agreement, Virgin Trains East Coast is investing one per cent of its revenue into innovation. The operator has also made other commitments as part of a wider industry initiative to simplify fare structures. 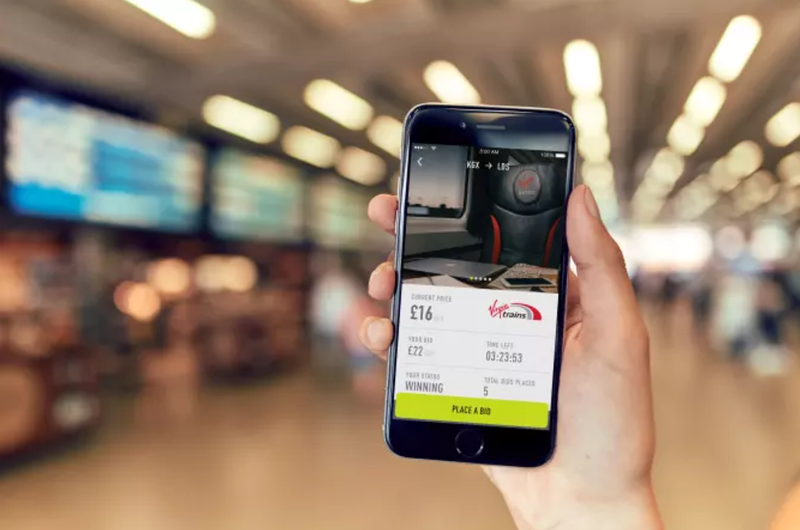 Suzanne Donnelly, commercial director at Virgin Trains on the east coast, said: “We have a strong record of innovating for the benefit of our customers and we are really excited to be partnering with Seatfrog to offer customers more opportunities to experience first class.